Anthony Scaramucci, being very shy. 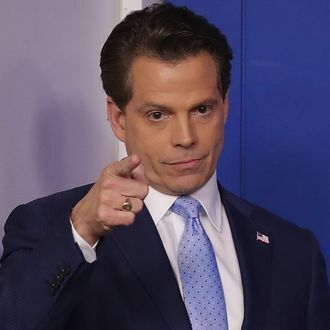 In a tweet posted this afternoon, Stephen Colbert told censors to gird themselves, because Anthony “The Mooch” Scaramucci will be appearing as a guest on The Late Show next Monday. Colbert doesn’t seem like The Mooch’s most sympathetic audience, but the Mooch also seems like he doesn’t turn down a PR opportunity — for better or worse. The former White House communications director has reportedly been delighting in his newfound celebrity, posing for photos with “fans” (with his mirror-finished blue aviator shades on) and even receiving an ovation upon walking into a Westhampton Beach restaurant recently, according to Axios. President Donald Trump doesn’t love associates taking the spotlight away from him, but he likely respects the reality-fame hustle of the man he hired for a job then subsequently fired ten days later.